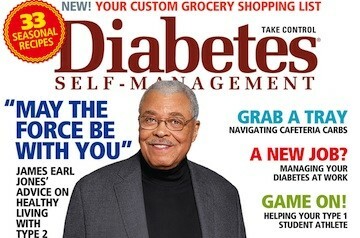 Want to hear from acclaimed actor James Earl Jones on how he’s managed to maintain a healthy lifestyle with Type 2 diabetes? Then be sure to pick up the September/October edition of Diabetes Self-Management at Barnes & Noble or your local grocery retailer. You’ll also receive a customized shopping list to help you make all of the delicious recipes in the issue, get tips for managing your diabetes at work, and more! Interested in getting our award-winning, expert information all year long? Take advantage of our limited-time offer and subscribe today to get six issues for $6!